The M-Vac is a swab-free collection system that retrieves particles from substrates and concentrates them onto a filter. This wet vacuum system collects DNA by directly spraying a DNA free solution onto a surface. It creates a ‘mini’ hurricane to loosen present DNA material, followed by and concentrating onto a filter that is subjected to DNA analysis. The M-Vac is able to collect DNA from large areas, textured, porous, and rough substrates that typically present themselves as challenges during routine casework. The M-Vac retrieved higher concentrations of DNA from items 1, 3, and 4 than the traditional DNA collection technique (Table 1). The concentration from the M-Vac collection for item 2 was lower than the traditional method however the M-Vac sampling yielded a more informative DNA profile. Item 2 yielded an additional male profile in conjunction with the expected female profile generating a mixture. 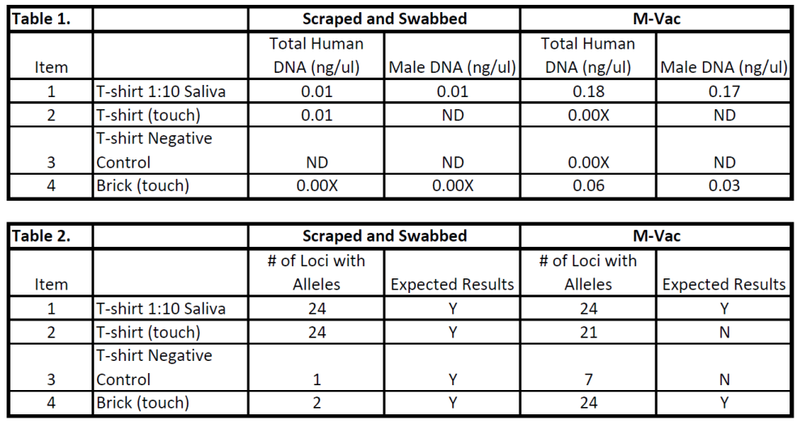 The negative controls exhibited one allele from the scraping/swabbing collection technique and nine alleles with the M-Vac sampling technique; however, both results are too weak to be reliably interpreted. The amount of DNA recovered from item 4 using the M-Vac was approximately 30x times more than the traditional collection techniques and yielded a full DNA profile whereas the traditional collection method only yielded two alleles (Table 2). The M-Vac consistently retrieved more DNA versus the traditional methods and is therefore a sufficient DNA collection system for porous, textured or rough substrates. Courtesy of Richland County Sheriff’s Department. The validation was developed, conducted, analyzed and written by Richland County Sheriff’s Department personnel. By mvacjb2014 in Uncategorized on March 16, 2016 .